Basic menu element: text you can click on to trigger desired action; it can have the following optional elements: image, shortcut and checkbox. Simple, usually gray line to separate distinct groups of menu items. It allows to pick item from drop-down combo box. It allows to enter any text. I found the above list rather limiting. 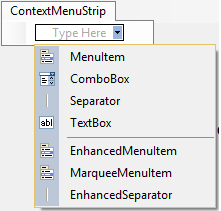 Very often, I needed to add into MenuStrip controls not present on the list. For example, I wanted to display radio button instead of check box, have descriptive separators and scrollable (marquee) menu items (see animated image below). Fortunately, there are ways to enrich set of objects that can be used as items in the ToolStrip. One way is to use ToolStripControlHost object to wrap any WinForms control as ToolStrip insertable control. There are plenty of Internet articles and examples showing how to do it. I used this method few times and found it temperamental and buggy, but I was able to achieve my goals. This article is presenting another approach: Components inherited from ToolStripMenuItem class. My reasoning for this solution was the following: base ToolStripMenuItem class contains most functionality I needed. Only real difference is how enhanced ToolStripMenuItem should present itself in GUI (extra text for separator, radio button as check mark or scrolling text). That means that the only thing I needed to change was how enhanced ToolStripMenuItem paints itself, what didn't look like a lot of work. Ability to display RadioButton image in place of CheckBox. Ability to group items into RadiButtonGroup to ensure that only one item within the group can be selected. It acts as MenuItemSeparator with additional ability to display static text. This component inherits from ToolStripEnhancedMenuItem. Additionally to parent class functionality it provides options for text scrolling. This property provides means to show several menu items as menu items group (in similar way as GroupBox groups RadioButton controls). All menu items with identical RadioButtonGroupName belong to the same group. Default RadioButtonGroupName is an empty string. If you want to have multiple groups in your menu, you should set this property accordingly. Default value is CheckMarkDisplayStyle.RadioButton. If set to CheckMarkDisplayStyle.Checkbox, TollStripEnhancedMenuItem behaves identically as "regular" ToolStripMenuItem. Otherwise item check mark is replaced with RadioButton image. Below are presented essential pieces of code responsible for enhanced functionality. For details, please refer to the attached zip file with the source code. /// if CheckMarkDisplayStyle is equal RadioButton OnPaint override paints radio button images. //base.OnPaint will render menu item. /// (select clicked item and de-select all others from the same group). //If CheckOnClick is 'true', base.OnClick will make clicked item selected. If set to true, ToolStripEnhancedSeparator displays separator line in areas not occupied by the separator text. Otherwise only Text is displayed. All enhanced behavior (drawing separator text and drawing separator line) is coded in OnPaint override (For full details, please refer to the attached zip file). ToolStripMarqueeMenuItem allows scrolling text Right-To-Left or Left-To-Right. Default value is MarqueeScrollDirection.RightToLeft. By default, width on menu item is determined by the width of the Text property. This can be a problem when scrollable text is very long. Using this property, you can limit minimum width of menu item to value smaller than dictated by size of Text property. This is one of two properties used to control speed text is scrolled with. It defines in milliseconds how often new scrolling position is recalculated and how often text is refreshed. This is another method to control scrolling speed. It defines how many pixels text should be shifted every time new position is recalculated. If set to true, when mouse is hovering over menu item, scrolling stops. Essential piece of code in this component is Timer event handler. In predefined intervals (defined in RefreshInterval property), it recalculates new text horizontal position of scrolling text. After calculation is done, it invalidates itself in order to allow test displaying in newly calculated position. Pease note, that ScrollStep property is also used in the below formula. /// Recalculate new text position and calls Invalidate to repaint. /// Method responsible for painting text every time new text offset is recalculated. Full source code and demo program of described library can be found in the zip file attached to this article.